We use email service from time to time in order to send messages to our contacts. You type your name at the bottom of the mail to denote that it’s actually you sending the email. Adding a signature in your Gmail can actually make this job a lot easier. When you add a signature in your Gmail, the emails you compose will automatically add the signature you’ve saved at the bottom of your messages. So are you ready to know how to add signature in Gmail? Well, let’s get started. If you get stuck at any point, please let us know. You can either email us at ‘admin@gmaillogins.com‘ or post a comment below. Step 1: First of all, open your Gmail account. Open a web-browser, or a new tab in this browser. Wait till you’re directed to your inbox page. Step 2: Second of all, click on the Gear icon at the top right corner of your Gmail page. 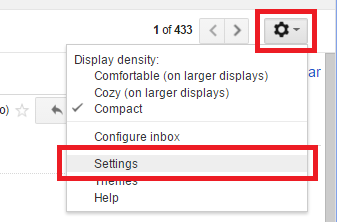 Step 3: Into the extension box, click on ‘Settings’ to open your Gmail settings. Step 4: Scroll down to find the signature section in your Gmail settings to add signature in Gmail. Step 5: Click on the circle below ‘No signature’ or in the input box. You can enter your signature in the space provided. Step 6: Type your desired signature. It can be your Name, Address, your favorite tagline, or anything you want to be automatically displayed in your emails. Furthermore, You can also add you email address, Facebook profile, or Twitter account if you like. You will need to copy the link from the address bar in order to do so. Highlight the link you’ve entered and click on the chain icon to make your link clickable. Step 7: Once you’re done with adding signature, scroll down to the bottom of the page and click on ‘Save Changes’ to save your signature into your Gmail database. Then, you will then be automatically directed to your inbox page. Step 8: Click on ‘Compose’. To see that signature is added automatically or not. Type your messages above the underline. The signature you’ve added is now a part of your email. Step 9: You can also remove your signature in particular messages by simply highlighting the added signature and deleting it. Step 10: Finally, you can also deactivate your signature by clicking on ‘No signature’ in your Gmail settings page, as in Step 4. Finally, don’t forget to ‘Save Changes’. We hope how to add signature in Gmail was of any help to you. Check video on how to add signature in Gmail.